PESHAWAR: At least one man was killed and four wounded Friday when a suicide bomber blew himself up outside an Ahmadi place of worship in Mardan, police said. “A suicide bomber was trying to enter the Ahmadis’ worship place, but he was intercepted by the guards outside and blew himself up,” Mardan police chief Waqif Khan told AFP. “A passerby was killed and four others were wounded in the firing and suicide attack,” Khan said, adding that it was unclear whether the man was killed by the bomb or by gunshots fired by the guards. Police have handed over the bomber’s body parts to a forensic team, he said. 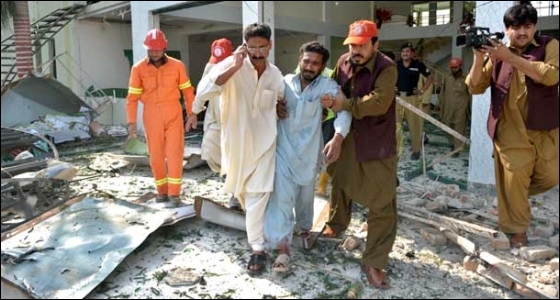 In May nearly 100 people were killed in the eastern city of Lahore after militants stormed two Ahmadi prayer halls launching gun and grenade attacks. Gunmen later raided the hospital where victims were being treated, killing four people in a shoot out.